No matter what your religious tradition or spiritual background, you cannot help but feel moved by Michelangelo's famous sculpture the Pietà. I had the fortune of seeing it in person this past Spring - below is my shoddy tourist's photo, the quality hampered by the density of the crowds and the protective glass that separates this iconic work of art from us, the masses. From an artistic perspective, the sculpture awes - it is impossible to believe that something of such grace and fluidity could be carved from a material as impassive and unyielding as stone. 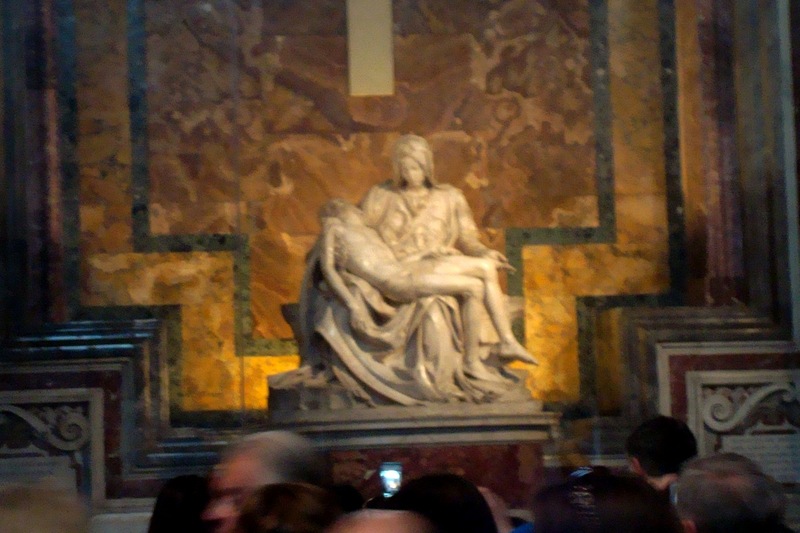 For those whose religious beliefs center around the life, teachings, and death of Jesus, I cannot even begin to imagine the spiritual awe the Pietà must inspire. For me, I was most struck by the overwhelming emotion conveyed in this poignant image of a mother cradling her dead son. Jesus' story is naturally the focus of the New Testament; the gospels written by his apostles to share the story of his life and work. But as the Pieta encourages us to do, shift your focus slightly for a moment away from Jesus to the people around him: his disciples, his friends, his family. Imagine their stories, their lives, their pasts. Imagine them living among us here in modern times, starting in the remote town of Nazareth, North Dakota. Imagine them as bikers, contractors, waitresses, Great Lakes fishermen, politicians, undercover DEA agents, and cancer patients. Imagine the angel Gabriel as a trumpet player in a nightclub and King Herod as a corrupt rural sheriff. Imagine them all with huge hearts and great compassion, with grave doubts and human failings. Add a generous dose of humor and a briskly moving plot, and you will have Tommy Zurhellen's Nazareth, North Dakota and its sequel, Apostle Islands. I humbly propose that the heart of any good story there is personal struggle for salvation (however you choose to define it) - how do we get on in the world, what do we do with the good and bad choices we make, what do we believe in, what tears us apart? - and whether or not the biblical story of Jesus appeals to you religiously, Zurhellen's novels beautifully capture the human drama that makes good reading. Both novels are told from the rotating perspectives of all those around Sam Davidson (our modern version of Jesus), and these are wonderful characters with clear compelling voices, each well worth getting to know. My personal favorite in Nazareth, North Dakota was Roxy, with whom Nazareth opens. Roxy's got moxie*, running off with baby Sam after his birth mother Mae leaves him on Roxy's motel room doorstep, and after shooting the man (not Sam's father) who tries to claim him. We gather it maybe isn't Roxy's first time on the wrong side of the law, but she is our unlikely heroine. It soon becomes clear that not only does she save this baby, the baby "saves" her as well. The first book takes us from Roxy's escape to the beginning of Sam's calling in young adulthood; along the way we encounter a kind carpenter, evil lawmen, jealous clergy, and much more. We consider the "threat" of those who don't conform and the "danger" of believers. At the opening of the sequel, Apostle Islands, Sam's following has grown significantly and attracted the attention of the FBI, the DEA and just about every local law enforcement organization with any jurisdiction. We meet many familiar characters and meet a wonderful new crew as well, those who are and will become the apostles. Here we consider the conflicting feelings and allegiances many of them have, Pete, the fisherman whose wife June suffers from advanced cancer and who will risk it all; Judd, who will be forced to betray Sam; Daylene, who loves Sam but knows their relationship is doomed. We ponder under what circumstances we might or might not believe in miracles and contemplate the power of forgiveness. Not to mention Apostle Islands has a really beautiful ending. Both novels were fast-paced,entertaining and engaging reads - I eagerly devoured the first in one rainy day and on the next quickly breezed through the sequel. 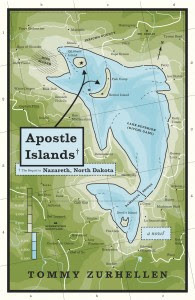 Can you read Apostle Islands without reading Nazareth, North Dakota? You could, and I tried, but I do recommend reading them in order - the characters and timeline will make much more sense and the sequel will be that much more enjoyable. I have to also confess to reading and really enjoying the endnotes before getting to the end - not only did they help me brush up on the biblical references, but it was also interesting to hear the author talk about the characters and the work, which also enhanced my enjoyment of the stories. Thoroughly enjoyed, and highly recommended. My thanks to publisher Atticus Books for electronic and paper review copies of the novels. *May I propose Melissa Leo to be cast as Roxy in the film version? !!!!!!!!!!!!!!!!!!! I need both of these books immediately. I used to live out in South Dakota, which is not exactly like North Dakota, but they probably have the same ambiance and I so miss/crave that part of the world. I love visiting it in fiction. Plus, I love the twisting/melding of Christianity into something different -- these books sound perfect for me. Yum! Also, I adore the covers. thanks Marie! yes, they are awesome covers - fun covers, fun reads. hope you get to enjoy! 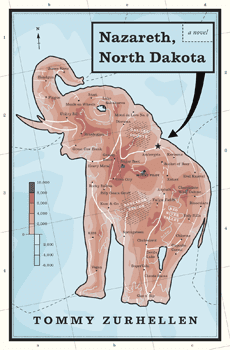 I received a copy of Nazareth, North Dakota by Tommy Zurhellen for review from Atticus Books. I read it during the recent Readathon.